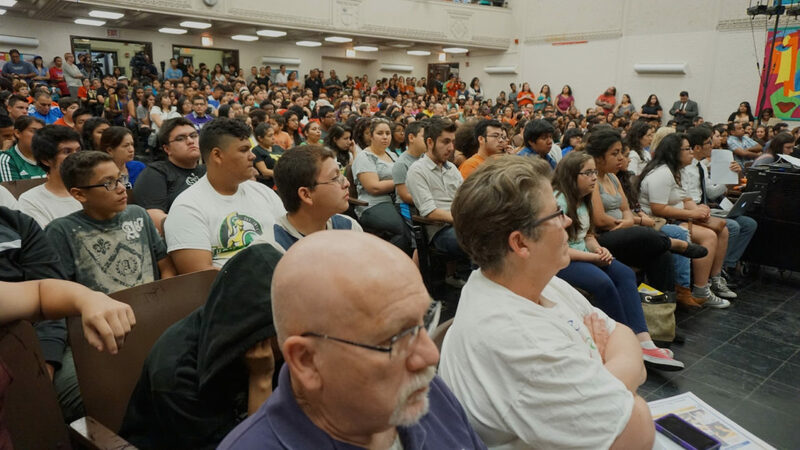 About 1,000 people attended a public forum Thursday, July 23, 2015, at Kelly High School to address a proposal for a Noble high school on the Southwest Side. In front of an estimated 1,000 community members, several local elected officials declared their support for a burgeoning anti-charter movement on the Southwest Side. Ald. Marty Quinn (13th Ward), Ald. 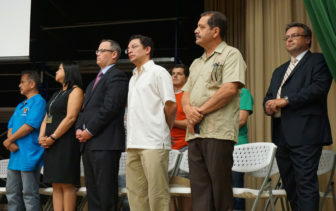 Raymond Lopez (15th Ward), and Cook County Commissioner Jesus “Chuy” Garcia joined Southwest Side principals, students and parents on stage at Kelly High School to speak against charter school expansion into the surrounding neighborhoods. Politicians such as (left to right) Ald. Marty Quinn, Ald. Raymond Lopez and County Commissioner Jesus “Chuy” Garcia have declared their support for a burgeoning anti-charter movement on the Southwest Side. The event was spurred by two new proposals from the Noble Network of Charter Schools in Brighton Park and Garfield Ridge. “Based on what I see today, I am very optimistic,” Kelly Principal James Coughlin said in an interview. The rally, organized by the Brighton Park Neighborhood Council (BPNC), was aimed at getting political clout for the anti-charter movement. Ald. Lopez agreed onstage to write a letter to the CPS Board of Education opposing the Noble proposals, following in the footsteps of Quinn and Illinois House Speaker Michael Madigan. Ten other city and state officials were invited to the meeting but did not attend: Sens. Martin Sandoval (11th District) and Antonio Muñoz (1st District); Reps. Daniel Burke (23rd), Edward Acevedo (2nd), and Silvana Tabares (21st); Alds. Edward Burke (14th Ward), George Cardenas (12th); and Mayor Rahm Emanuel. Meeting organizers say they also invited newly appointed CPS Board President Frank Clark and Forrest Claypool, who did not show up. “I think we should consider a pause on charters,” said Cardenas, whose Southwest Side ward includes parts of Brighton Park, McKinley Park, Little Village and Back of the Yards. He added that CPS needs to get its “financial house in order first” by addressing chronic funding and pension problems. In addition to the elected officials, 18 area schools pledged their formal support of the campaign through resolutions passed or soon-to-be passed by their Local School Councils. These include: Kelly, Solorio Academy, Back of the Yards College Prep, Curie Metropolitan, Richards, Hancock College Prep, Kennedy, Hubbard, and Gage Park high schools; Shields Middle School; and Shields, Burroughs, Davis, Brighton Park, Calmeca Academy, Evergreen Academy, Louis Pasteur, and Everett elementary schools. The Southwest Organizing Project, Grassroots Collaborative, Raise Your Hand and the Chicago Teachers Union are also involved. Coughlin, the Kelly principal. said he had expected around 150 people to attend the event and that the large turnout surprised him. “We owe a bit to the [North Side] schools for coaching us on how to do this,” he added, referring to similar campaigns in prevent Noble from opening in the Uptown and Rogers Park neighborhoods earlier this summer. Patrick Brosnan, the Brighton Park group’s executive director, said the Southwest Side anti-charter campaign plans to mobilize supporters to attend an Aug. 10 Neighborhood Advisory Council meeting at Richard Daley College about the Noble proposals. CPS is recommending that the Board of Education approve proposals to open new Noble and KIPP campuses; also the district is placing 10 charter schools on an Academic Watch List, including two struggling CICS campuses. Community activists continued Monday to put pressure on Noble to withdraw a proposal to open a charter high school on the Southwest Side. At a meeting this weekend, the area’s Neighborhood Advisory Council (NAC) voted against the proposal.